An uncomfortable and potentially dangerous side effect of facial paralysis is the inability to completely close the eyelids. Blinking and closing our eyes keep our eyes lubricated to prevent painful drying and protect them from foreign objects. It is possible for eyelid function to return in some patients with facial palsy, however there are surgical options for helping your eyelidfunction if it does not return on its own. Babak Azizzadeh, MD, FACS and his team of oculoplastic surgeons at the Facial Paralysis Institute are highly regarded for their work in facial paralysis treatment and can help facial palsy patients regain the ability to close their eyes with platinum eyelid chains. Platinum eyelid chains are very similar to eyelid gold weights, but made of platinum, a higher density metal. The higher density means that the same weight can be achieved with a smaller device. The device is comprised of small platinum pieces linked together to form one chain-like piece. The linking of the pieces provides greater flexibility than you can get with a solid gold weight device. Studies have also shown platinum chains to be slightly less visible than gold weights, while both have a similar effect on eyelid closure. There are a few treatment options available for treating facial palsy patients with incomplete eye closure including platinum chains, gold weights, eyelid springs, and tarsorrhaphy. Dr. Azizzadeh and Dr. Massry will examine your condition and determine the best treatment option for your case during your consultation. Specialists at the Facial Paralysis Institute frequently implant platinum chains in facial paralysis patients who experience a great improvement in quality of life upon regaining the ability to properly close the eye. If Dr. Azizzadeh and his team decide that platinum chains are a good option for you, they will start the process by determining the appropriate size and weight of the implant. Sample chains will be temporarily affixed to the outside of the lid until the right weight for restoring eye closure is found. Then, our highly respected oculoplastic surgeons will implant the platinum chain into the upper lid by making a small incision in the crease. The chain will be attached to the upper eyelidmuscle with sutures and use gravity to restore the patient’s ability to close the eye. A good candidate for platinum eyelid chains is a patient living with a form of facial paralysis that is preventing natural eyelid closure. 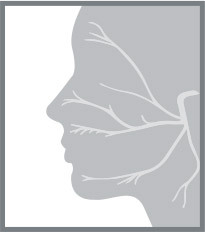 With several treatment options available in addition to platinum chains, the best treatment for your unique condition will be considered carefully by the expert team of surgeons at the Los Angeles Facial Paralysis Institute. If you’re suffering from the side effects of the inability to fully close your eyes and are seeking a minimally invasive solution, contact the Facial Paralysis Institute to schedule a consultation. Q: Will the platinum chain be visible after the procedure? A: Platinum chains provide the least visible support for normal eyelid closure in facial palsy patients. There will still be a small bump visible on the eyelid in the area of implantation, but it is placed in the crease of the lid in order to use the natural contour of the eye to try to disguise it. Discuss any concerns you have with the surgeons during your consultation. A: The implanting of platinum chains is an outpatient procedure where the patient is able to return to the comfort of their own home the same day. It is common to experience some bruising and/or swelling after the procedure, but it will improve over the next couple of weeks. Typically, patients experience eyelid closure immediately after surgery with continued improvement over time. Your surgeon will give you detailed post-op instructions to ensure proper healing and a fast recovery. Q: What is the difference between platinum chains and eyelid springs? A: A platinum chain is a weighted device designed to use the force of gravity to restore eyelid closure, whereas eyelid springs are designed to interact with the eyelid musculature not damaged by the facial nerve in order to reestablish eyelid function without conscious effort. Eyelid springs can also be a great option for patients suffering from incomplete eye closure. The expert team at the Facial Paralysis Institute will examine your situation and decide which treatment would be the best. Q: What can happen if incomplete eyelid closure is not fixed? A: The ability to close our eyes keeps our eyes lubricated otherwise they will become painfully dry which could cause eye damage. Closing the eyes also prevents foreign objects from harming the eyeball. Prolonged incomplete eye closure can cause permanent eye damage. Contact the Facial Paralysis Institute to schedule a consultation if you are suffering from incomplete eye closure caused by facial paralysis. 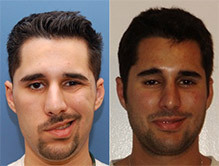 Why Trust the Facial Paralysis Institute? 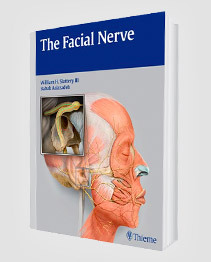 The board-certified surgeons at the Facial Paralysis Institute work together to provide patients with the best facial paralysis treatment possible. Facial plastic and reconstructive surgeon Dr. Azizzadeh performs platinum chain procedures with oculoplastic surgeon Guy Massry, MD. Together, they effectively restore eyelid closure to patients suffering from facial paralysis. Trained at Harvard, Babak Azizzadeh, MD, FACS is a board-certified facial plastic and reconstructive surgeon and one of the most respected facial paralysis surgeons in the country. He is actively involved in ongoing research and teaching, and has been featured on media outlets such as the Oprah Winfrey Show, The New York Times, and Discovery Health. Often referred to as “Dr. Fix-It,” Guy Massry, MD is an oculoplastic surgeon who specializes in cosmetic surgery of the eyelids. 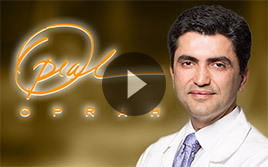 He is a USC School of Medicine graduate and well known for his research in the field of oculoplastic surgery. Dr. Azizzadeh and Dr. Massry work together to provide their facial paralysis patients the best, most natural looking result when restoring eyelid function. To learn more about platinum eyelid chains, or to schedule a consultation with the specialists at the Los Angeles Facial Paralysis Institute, call us today at (310) 657-2203. Don’t let incomplete eyelid closure affect your quality of life. Let our experts help you today.